The Southern Maine group of the Industrial Workers of the World labor union is proud to present Anatole Dolgoff, author of AK Press’s Left of the Left: My Memories of Sam Dolgoff. 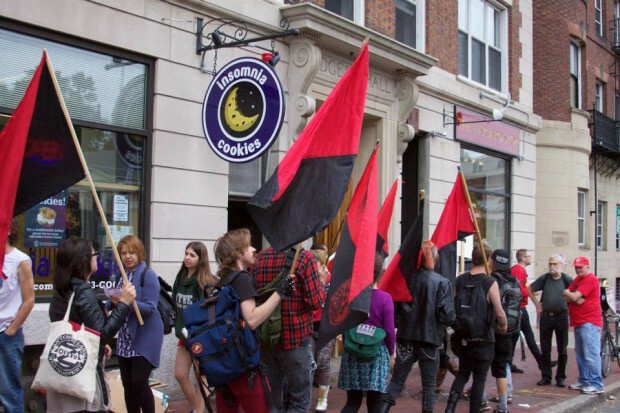 Anatole will be appearing at Local Sprouts Cooperative cafe at 649 Congress Street in Portland, Maine on Tuesday, May 2 at 7:00 PM for a discussion of his book, IWW labor organizing, and his famous left activist parents, Sam and Esther Dolgoff. Sam Dolgoff (1902–1990) was a house painter by trade and member of the IWW from the early 1920s until his death. Sam, along with his wife Esther, was at the center of American anarchism for seventy years, bridging the movement’s generations, providing continuity between past and present, and creating some of the most vital books and journals from the Great Depression through WWII, the Civil Rights era, and into the last decade of the century. This instant classic of radical history, written with passion and humor by his son, conjures images of a lost New York City, the faded power of immigrant and working-class neighborhoods, and the blurred lines dividing proletarian and intellectual culture. Workers at Tom Cat Bakery sharpened their resistance against company attacks this summer with a solidarity BBQ in front of the Queens-based factory. Tom Cat’s private equity owners, Ancor and Merit Capital, are seeking devastating health care cuts and other takeaways from workers in contract negotiations with the Bakery Union. Dual-card IWW members are leading a struggle to build long-term power and secure a good contract, after beating back a de-certification attempt from a mob-dominated union earlier this year. On May 4th 2014, members of the Twin Cities IWW and supporters withstood a violent and deliberate attack on a picket of Sisters’ Camelot, whose canvass workers went on strike in March of 2013 and have endured vicious union-busting efforts from the organization ever since. After some twenty minutes of peaceful picketing, Sisters’ Camelot supporters organized an escalating series of attacks and attempts to break the picket line, eventually tackling an IWW member to the ground and beating him until other Wobblies pulled them away. Earlier in 2014, a committee organizing the 80th anniversary of the 1934 Minneapolis Trucker’s Strike was asked to participate in the official Heart of the Beast Theatre May Day Parade. Many members of the committee, which includes many IWW members, were concerned about whether or not HOBT was working with a known union-busting firm. In April, a member of the Remember 1934 committee made a discreet inquiry to the artistic director of HOBT, and an assurance was made that by mutual agreement between HOBT and Sisters’ Camelot, Sisters’ would not be at the festival. However, on Sunday, as marchers with the Remember 1934 committee arrived at the park, a union member and striking canvasser alerted us that the Sisters Camelot bus was parked on 35th St near 13th Ave, directly facing Powderhorn Park, where the festival was occurring. Acting in solidarity with the striking canvassers, a group of Wobblies and community allies began a peaceful picket on the sidewalk in front of the bus’s serving window. In their efforts to achieve their stated goal of breaking a peaceful picket line, Sisters’ Camelot steadily escalated their violence against IWW members. First they physically blocked workers and their supporters–at one point a Sisters’ Camelot supporter physically pushed her small child into the picket line. IWW members responded by peacefully moving around individuals trying to block their way. Following this failure, attackers began shoving and physically attacking picketers. Each time, IWW members did their best to defend themselves and continue the picket line. Meanwhile Sisters’ Camelot supporters did nothing to intervene or remove those individuals, evidently happy to have them act as their goons and enforcers. Eventually, several members of this cadre organized a group of people to encircle the picket, take picket signs and personal material and destroy them, and forcefully prevent the picket from continuing. At this point, an IWW member was tackled to the ground, where he was scratched and beaten by a member of Sisters Camelot as well as several supporters. Once more, it was up to the IWW picketers and supporters to remove these individuals, while those who had mobilized the attack looked on approvingly. one of this is particularly surprising: while Sisters Camelot and their allies claim to be anti-oppression, they have repeatedly shown throughout the last 15 months that they are more than willing to ally themselves with openly anti-worker, anti-woman, and anti-queer individuals and institutions in order to get their way. When Sisters’ Camelot was brought to court over the illegal firing of a canvasser for union activities, they employed the services of John C. Hauge, a lawyer who boasts of defending corporations against sexual assault cases, OSHA claims, wrongful death lawsuits, and aiding companies in “union avoidance” efforts, among other contemptible practices. Laughably, they have repeatedly decried “aggression” from their striking workers and the IWW. To be perfectly clear, anyone who mobilizes their friends to assault a peaceful picket of workers and their supporters, who associates themselves with homophobes and sexists and then disclaims any responsibility for their actions, or who supports this type of activity, has no right to consider themselves a part of any progressive or radical community. To even consider otherwise is a slap in the face to everyone who fights for a better world. We don’t take organized assaults on our members and friends lightly. After the assault on our picket line, we feel it is necessary to take further action against Sisters Camelot. The Twin Cities IWW calls for a complete economic, organizational, and charitable boycott of Sisters Camelot. If a scab canvasser comes to your door, turn them away empty handed. If they approach you about hosting a food share, tell them they are not welcome. Any individuals or organizations who continue to support Sisters Camelot will be associated with their shameful actions. There is no space within our communities for any organization that operates in this way. We Never Sleep. We Never Forget. The Industrial Worker is the official (English language) newspaper of the Industrial Workers of the World (IWW) revolutionary labor union.